Yugoslavia between the late Eighties and early Nineties: a country experiencing difficulties in defining itself as a strong unit. Individual regions – or states, rather – felt distant from one another, forced to share a single government that seemed unable to satisfy individual, highly heterogeneous, demands not grounded in a common history but in extremely different cultural, religious and even linguistic roots. The art system mirrored the ‘closed’ national system and its concentration on local diversities. Neue Slovenische Kunst, an association of art groups of multidisciplinary origins whose principal members were IRWIN, Laibach and the Gledališče sester Scipion Nasice theatre company, tried to find a way out of the closed and self-referential universe of local art. In 1992, following the declarations of independence from the Federal Republic of Yugoslavia by Croatia and Slovenia, Neue Slovenische Kunst founded the NSK State in Time. Instead of requesting a territory, NSK was constituted on the basis of a “state of mind” with borders shifting in relation to the state’s individual members. At the time of its constitution NSK State in Time was defined as an abstract entity, a suprematist body, installed in a real social and political space as a sculpture, consisting of the body warmth, the movement of the spirit and work of its individual members. Twenty years have now gone by since then. 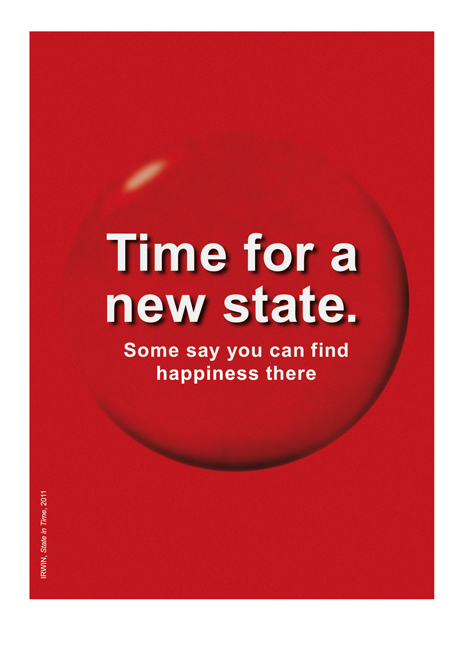 There are now over ten thousand citizens holding an NSK State in Time passport and they belong to that category of individuals who never tire of thinking about a new state, a better state, where one might perhaps find a little happiness too. They belong mainly, but not exclusively, to the art world: a significant number of NSK citizens come from African states and are perhaps able to see more clearly that a new state cannot be merely an art project. The last but one NSK passport office has only just closed down at the MoMA in New York. The next one will be opening in Reggio Emilia during an exhibit in which IRWIN will use photographs of performances and mises-en-scène of their historical, artistic and political evolution to tell the story of NSK State in Time’s first 20 years of life. That, however, is not all. In Reggio Emilia IRWIN will encourage people to think about the conditions of the New State, something there is a widely-felt need for, even in Italy. IRWIN is a Slovenian art group born from the association of the young artists Dušan Mandič, Miran Mohar, Andrej Savski, Roman Uranjek and Borut Vogelnik, originally from the Punk and Graffiti scene in Ljubljana. In 1983 they merged and founded the group named Rrose IRWIN Sélavy, in tribute to Marcel Duchamp’s female pseudonym. In 1984 they co-founded, with the music group Laibach and the Gledališče sester Scipion Nasice theatre company, a broader collective of artists known as Neue Slowenische Kunst (NSK), meaning New Slovenian art, which was to subsequently involve other groups of artists engaged in graphic art, video art and philosophy. Collaboration and sharing were at one and the same time the cornerstone and the inevitable consequence of Neue Slovenische Kunst, which positioned itself in the political and cultural scene of the Federal Republic of Yugoslavia. With the collapse of socialism in the early Nineties the underlying conditions of their artistic engagement radically changed and in 1992 Neue Slovenische Kunst was transformed into NSK State in Time. With the proliferation of new states which followed that collapse, the NSK collective decided to constitute themselves into a state. Not a territorial state, but a state of mind which takes tangible shape through public appearances in cultural projects. Thanks to these projects, its image and contents become clear and relationships are forged between its citizens, who are growing in number as a result of the initiatives they participate in.